No, The Professor is not the examining the existential yell/yelp of the Edward Munch painting. And no, he’s not focused on the nicely nuanced Sarah Michelle Gellar movie about a certain masked psychokiller or any of its Courtney-Coxed sequels… This is about “Scream,” the seminal music video that belongs in the pantheon of this short-form medium because it has been intensely and dramatically designed, and because it is the most revealing of all of Michael Jackson’s many music videos. It provides viewers with a peek into the otherworldly, lonely, haunting and frustrating life of a global celebrity. 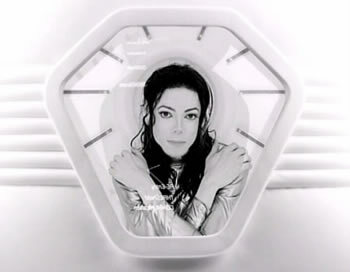 In the video, Michael travels inside of a spacecraft that is at once his vision of utopia [a stress-free funhouse built for play that jets about the cosmos] at the same time that it his idealized, if unintentional funerary vessel [a contemporary rendition of what the Egyptian pharaohs of old would be transported inside of after their death], and what he, in turn, would use on his way to the promised afterlife. Design writers don’t often write about music videos, but The Professor can’t understand why anyone interested in the larger cultural concerns that are increasingly part of the design profession’s purview would be oblivious to their charms. 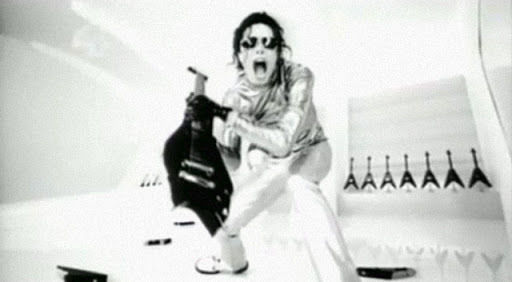 One such video worthy of detailed consideration is “Scream,” the black-and-white masterwork directed by Mark Romanek; The Professor believes that Romanek has shown himself to be a master of the music video in terms of artistic achievement, creative expression and brand communication. Other notable videos he has directed include “Closer” for Nine Inch Nails; “Cochise” for Audioslave; “Hurt” for Johnny Cash; “Are You Gonna Go My Way” for Lenny Kravitz; “Devil’s Haircut” for Beck; and “Criminal” for Fiona Apple. 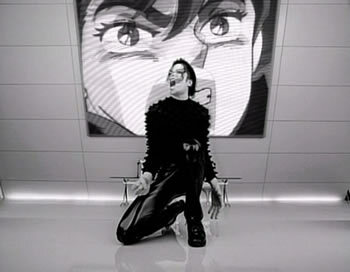 “Scream” featured a poignant pairing of Michael and Janet Jackson and was the lead single on the HIStory: Past, Present and Future, Book 1 album of 1995. It’s one music video that The Professor believes has not only stood the test of time, but should be required watching—as in closely and critically examining it— for students of design everywhere and of every age. Not because it reportedly was the most expensive video ever done [The Professor doesn’t give a hoot about that] or because it won a Grammy and a slew of MTV awards [ditto], but because “Scream” is a musical work that in Romanek’s hands simultaneously draws upon the strengths of art, craft and design in a way that transcends any single discipline. Romanek puts the two Jacksons together on a double-humped disk of a spacecraft. It’s The Professor’s hypothesis that the ship not only represented the isolation that Michael felt at the time; it also encapsulated the “alienness” that he increasingly embodied in his appearance and acted-out in his behavior. Multiple headphones worn by both Michael and Janet in the video further highlighted the separation [or sense of separateness] that the Jacksons felt between themselves and the rest of the world; it also presages our current “Big Headphone Phase” that comes at a time when our music is more de-materialized and ephemeral than ever. The fact that the refrain to the song keeps repeating “Stop pressurin’ me / You make me want to scream” does little to allay that feeling. Nor does the fact that Romanek repeatedly jumps between dance action and still-life through quick cuts and a pulsing approach to lighting. One element sets off of the other, creating a rhythm of dynamic and static scenery, each stripped-down and carefully composed. Long before films like Elysium showed that the wealthy would leave our planet in a heartbeat for the bucolic abundance and artificially artisanal life were it available in Earth orbit, the “Scream” video showed far earlier that groups as small as two would likely exit Earth as well given half a chance. The irony of “Scream” from Michael’s perspective was that the serenity of space and the relative distance that the spacecraft provided still weren’t enough to escape the media hellhounds of Planet Paparazzi. A brazen newscaster comes blaring through time and space to fill the large large-screen wall display in the middle of the video; the pundit grows more and more agitated as the video’s pace further quickens. 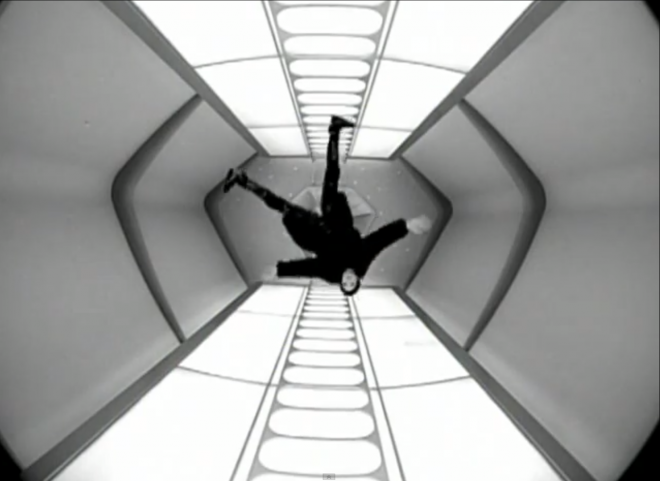 Given the sense of angst that this creates, it’s not surprising that section after section of the video was focused on the breaking of various objects on the unnamed, unidentified Jackson ship: the glass of the sleeping pods shatters; the ceiling in the Zen meditation space shatters; the guitar in the intro segment is smashed and shatters; in the recreation segment, a couple of the classical glossy black amphorae [set up in a row of nine] shatter after Michael hits them with a levitating silver puck via a textured spacepaddle-racquet; it all culminates in the explosion of the chromified “scream” logo that shattered into shards at the end of the video. 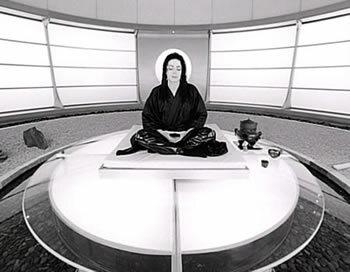 In one of the more engaging segments, a spiky eye-like form displayed on a screen quickly morphs into the word “gallery” and soon both Michael and Janet are taking turns slouching across a sliding and spinning [remote-controlled?] Big Easy Armchair designed by Ron Arad  while looking at artwork that appears out of nowhere. It’s like a miraculous art fountain that instantly pours its bits into two- and three-dimensional exactitude. The Professor notes that this aspect of “Scream” serves as early testament to the degree to which all that was solid has now melted into air, a decades-long trend toward the dematerialization and demassification of objects; mass is being continually replaced by IQ [and a cause for hope!]. Michael looks at painted works works by Andy Warhol, Jackson Pollock and Rene Magritte; Janet examines statuary of a cycladic head, a shimmery Buddha, and a classical Greek/Roman statue of what appears to be a saint. They switch from form to form so fast that they can’t possibly be made of molecules; this is no advanced 3-D printing scenario, it’s not even a replicator; these are completely digital holographs, capable of materializing instantly on command and appearing as solid as the canvas or stone that they are made from. Like David Bowie’s Ziggy Stardust, Michael isn’t from around these parts, and in the video, he doesn’t’t even pretend to be an earthling any more. Being free from Earth, he was free of everything that had been holding him back: he can finally become Post-Human and celebrate his deformations. He can also at last have a shot at escaping from the clutches of imperious critics and the 24-7 paparazzi, and he can simultaneously float free of physical laws. Michael and Janet both float, spin and rotate repeatedly through various sets. They also leap onto walls and, gecko-like, stick in utter defiance of friction and gravity. As The Professor observed at high-end retail stores like Comme des Garcons in the late 1980s, an open spare interior goes a long way towards telegraphing a message about the expense of the goods inside: fewer things, more ka-ching, and the bareness, spareness and openness of Michael’s spacecraft said it all. The trick that Romanek masterfully pulled with “Scream” was to seize upon Michael’s ascendant otherness—his ever-more alien complexion and altered feature set—and to highlight precisely those features in the video. Then he further accentuated them in his decisions about how to accessorize Michael and Janet, right down to the clothing choices and shoes [all-white, all-black or a lustrous and futuristic silver]. 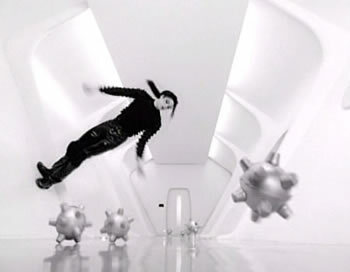 The spacecraft, and everything in it—including Michael and Janet’s hair, make-up and clothing—the Issey Miyake crenelated tops, the tight, super-shiny, wet-look, form-fitting trousers, the twenty custom-made Flying-V Gibson guitars—all have been completely designed and curated, and done so way before such considerations were commonplace. Like William Morris demonstrated in his Red House building at Bexley Heath, Romanek has fabricated a total-design environment; a unified and total design is not news. The difference is that Morris, the founder of the 19th century Arts & Crafts Movement, built a place of permanence that he lived in out of the brick, stone, wood and plaster available in his day while Romanek has built an evanescent and mobile spacecraft that in essence is all stage set and sound stage. The combination of the ship’s sculpted interiors and the Jackson’s pissed-off demeanor practically guaranteed that Michael and Janet would romp through the sets, that they would treat the furniture like high-style playground equipment to bounce upon, climb up, grab onto or strut through. Everything inside the spacecraft seemed to be artificial; even the bonsai trees in the meditation space referenced how culture trumps nature, reinforcing the provocative, but-oh-so pertinent message that biology is not destiny. The spacecraft is the only place that allows escape: escape certainly from the physical laws of gravity, decay and aging; but also escape from the pressures and the haunted inner voices that come with being a global construct of a Pop star; certainly escape from the media maelstrom that defined Michael’s later life; and, lastly, escape with Janet, the only member of Jackson’s family who could likely relate to what Michael had, and was, going through. In the video, the two siblings become interchangeable: in more than one segment of the video, Janet’s face fades into Michael’s, and for a moment it’s possible to see the pair of visages as those of two strikingly beautiful young women locked together in the purity of outer space. 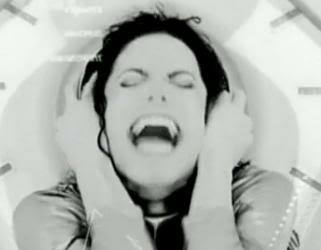 “Scream” reflected Michael’s interstellar dreamworld, his vision for how the emptiness of outer space would serve as a place for him to rest-up from a world gone weary and how it might work as his permanent resting place if, or when, it was all over. It would be his lustrous chariot to the heavens, his sarcophagus to the stars, his own Khufu ship akin to the solar barge of ancient Egypt’s King Cheops. Through Romanek’s efforts, “Scream” offers a vision of how the otherworldly can become home base for a home-grown alien, just as it offers up a proposition for how a sleekified space disk might not only contain a pod-like coffin but actually be a cosmic burial chamber, the ultimate funerary habitat because it melds art, craft and design in a powerful fusion of integrated anomalies. The Professor notes that “Scream,” even almost 20 years after it was released, is still captivating today. That’s partly because music videos don’t necessarily have to tell a story or offer a sustaining narrative to be successful, but the great ones like “Scream” have [and hold onto] an idea around which the all of the details and elements revolve. “Scream” does that, absorbing lessons from antiquity to the 20th century. Besides nods to 4th Dynasty pharaohs and 19th century architects, references include Stanley Kubrick’s space station  from the still mind-blowing film 2001 as well as Katsuhiro Otomo’s animated cult classic Akira  that was set in a thrillingly dystopic Neo-Tokyo of 2019 and based on the manga graphic novel of the same name. If The Professor has one criticism of “Scream”—if he had to identify one weak link in the chain of design decisions that comprise the video—he would say it was the spacecraft-tomb itself. 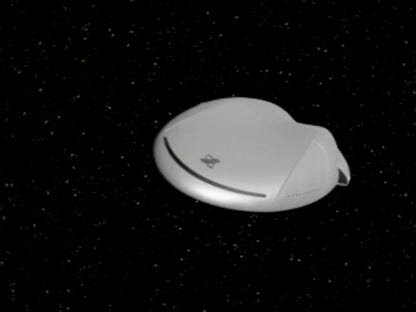 Neither rocket archetype, speed form nor interplanetary voyager, it instead resembled a weakly rendered, inverted pie plate with a pair of baby Bactrian camel humps on the topside, a “You void the warranty if you open this” bottomside, and a poorly blended tail flap grafted onto the backside, just ahead of an inexplicably blinky triangular-assembly thing. In the end, it was more object than ship, akin to something that, at a more head-sized scale, might be the functional headgear adornment found on Geordi LaForge from Star Trek Next Generation, but then again, that’s why they call me The Professor.